Since my daughter started kindy, I have been looking for nutritious foods to prepare ahead of time for her lunch boxes. The problem is, most of the stuff I was cooking for her pre kindy had nuts in it. The other day a Skinnymixer posted a photo of two meals she had prepared, risotto and sweet muffins… and that’s where the idea for Risotto Frittata with a Twist came from. Any time we go to an Italian restaurant, the kids have arancini – they love it and we love it because it doesn’t make a huge mess. Except, its basically deep fried crumbed rice and not all that nutritious. I feel like this recipe is a great compromise on traditional arancini, the flavours are all there but with the added bonus of hidden veg! Add parmesan and cheddar to mixer bowl, mill for 10 sec/speed 9/MC on. Set aside. You can either clean your bowl now, or risk it burning and needing to clean it later. Add onion and garlic to mixer bowl, chop for 5 sec/speed 5/MC on. Scrape bowl down. Add rice, stock concentrate, water, vinegar and pepper to mixer bowl. Put your chopped vegetables in your deep steaming tray and put it in place. Cook for 25 min/steaming temperature/reverse/speed 1. Set aside in a thermal server or bowl to cool. Without washing the bowl, add cooked veggies and blend for 3 sec/speed 9/MC on. Scrape bowl down and repeat until desired consistency is achieved. If your kids are fussy with vegetables, blend until fairly smooth. Stir veggie puree and 2 / 3 of the reserved cheese blend through the risotto. Leave it to cool on the bench for 1-2 hours. Preheat oven to 200°C or 400°F and stir the eggs through the risotto mixture. Put muffin cases into muffin tins and portion risotto mixture out amongst muffin cases or alternatively silicone muffin trays. Sprinkle the tops with reserved cheese blend and bake in the oven for 30 min or until deep golden brown. Allow the muffins to cool for 10 min before taking the cases out of the muffin tin, so they dont get soggy. They will be very soft you need to allow to cool completely before serving. Serve cold or at room temperature. These freeze and defrost perfectly, in about 3 hours outside of the fridge. Perfect for lunch boxes. You can use whatever veg you like in this. You can also stir through ham or bacon if you like. This fantastic 'Laptop Bento Box' Lunch Box was kindly donated by 'Lunch Boxes with Love'. Bellini users: This recipe most likely will not work in the Bellini due to the lack of steam generated on a low speed. To get around this, prepare your risotto alone. Once that's done, set it aside and add 300 g or 10.6 oz water to your mixer bowl and steam your vegetables for 20 min/steaming temperature/speed 4. Or just microwave them! At step 4 use ST temp if using an Intelli, use 120°C or 250°F if using a Supercook. We love this Nik! I make it and my kids have it for breakfast. The only breakfast food they like is sugary cereal and I don’t like them having it so this is our delicious compromise. Not sure if it helps anyone but I hate washing the varoma so I actually blitz the raw veggies and put them in the bowl to cook with the rice, I put in about 100g less water to counteract the water from the zucchini. Is there any info on calories/ carbs in each muffin? It is currently on the to do list for our professional nutritional panels, so hopefully soon! Just made my first batch of this risotto and from the first taste I knew it wouldn’t last to make the frittatas! A hit for all the family. Frittatas next time! Why did I wait so long to try these??? I added in pumpkin, beans and mushrooms as extra veg and my veggie hating husband had to be made to leave the kitchen while it cooled so he wouldn’t eat it all. Dinner time came and 2 of the 3 kids gobbled them down the third wouldn’t even try them as they looked yuk! Absolute winner in my eyes. Thanks so much Nik for your time and dedication you put into all your recipes. These are delicious! Would love to know if anyone has worked out the nutritional information for these??? Do you think they would work without the ACV? If not, any suggestions as an alternative? I substituted the rice for cooked tiny star pasta shapes. I added 60 grams spinach and a tiny can of sweet corn to add veggies for the veggie lovers here. The pasta ones were very yummy. Would these work with wild rice? Just made this for the first time, as per recipe. Omg it’s delish!! Simple comfort food flavours and so morish! These are awesome with bacon. I would totally not consider making them without bacon! Lol. They were a hit with one of my kids and hubby. That’s not a bad result! These are a great dish to have in the fridge for an easy lunch with some salad. Yummo. Thank you! I thought they were yummy. But my kids didn’t like them and my husband thought they were ok but they have never been fans of risotto. hit with everyone 🙂 husband and my two and three year old boys. Thank you! I was about to tell the world I had had my first ever fail with one of your recipes! My error in reading 100g of water instead of 1000g. I make risotto often, but must have had a brain fade. Bruce (Thermy) didn’t cook my veges, I burnt the rice, and I thought dinner ruined. But, I hate waste, so I endeavoured to ‘fix’. The result was an amazing Risotto Fritatta, made as a pie. Hubby LOVED it, rest of family loved it. Thanks again for your efforts and your recipes. Thank you for your hard work in giving us your recipes, I made these tonight and love them. Wow Nik, I made these and they were delish!!! My partner made them disappear in 2 days though so had to make some more…. Thank you so much! Help ….I can’t get these into muffin cases…….I can’t stop eating it………so friggin delicious…..help!!!!!!!!!!!!!!!!! Made these the other day and they’re super yummy! I added 100g pumpkin just because, and may have gone overboard with the cheese a little, also just because. I wouldn’t recommend leaving the risotto mixture on the bench to cool down for so long (cooked rice is meant to cool down quickly or can breed a bacteria that gives you food poisoning), so I ended up putting it in the fridge. Next time I’ll divide it into a couple of bowls in the fridge to cool down faster. Love all your recipies! Yet to try a dud!! Love these! Have them all ready to go for the kids lunch boxes! They love them and think they are cakes 😂😂 what they don’t know won’t hurt them 😝 thanks Nik! Made these dairy and egg free by leaving out the cheese and using egg replacer, then baked them in silicone cupcake pans…. Worked a treat! Wow these are so good, I admit I was making them for the kids but I had to taste test and they are beautiful! Thank you for another great tasting recipe! They do taste lovely. The flavour is definitely there. I just didn’t like how caked on the bowl was after putting the rice in a separate bowl. Lots and lots of scrubbing and soaking. I had the same sticking problem Kandis. They are nice but I think that would put me off making them next time. Im not a fan of risotto but thought i would make these for the family to try. They were tasty but not a hit with the family. Made these last night for grandkids to try. They loved them! Master 5 ate 4 and wanted more Miss 3 ate 3 of them. A big hit, and a great idea. These are amazeballs! So easy to make and great for lumchboxes. Can I bake this in a tray or slice tin if I don’t have muffin cases. Has anyone tried this with a long grain rice? I usually use red and black rice for extra nutrition. Wondering how it would go with pre-cooked long grain rice, do you think it would still hold together? I made these for dinner tonight and it was delicious! I added a bit more of each veggie, plus frozen peas, as well as some bacon, chorizo and Italian mixed herbs. I couldn’t wait 2 hours for it to cool on the bench before baking so divided it in a couple of containers and put in the fridge for 20 mins. I baked it in 2 large silicone cake pans as I didn’t have silicone muffin pans. It turned out great and will become a regular on our menu. Thanks Nikalene! Could these be made without cheese for a dairy free option? Or would they fall apart? I think maybe add another egg. Shouldn’t be too dry then. Thanks I made half without cheese (just stirred through before putting in the oven) & they were delish. I also whizzed up some ham and added for flavour. These should come with a warning about how delicious they are. I ate a spoonful while the mixture was cooling & I was lucky that any ended up in the oven. I doubled the veggies & also baked them & left the eggs out. These are divine! I really wasn’t sure what to expect but they are fabulous. 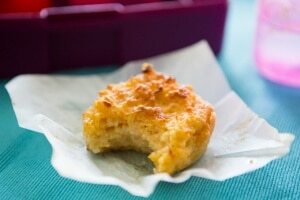 Great flavour, easy to make, defrost well and very moreish! Will be making these again!! Thanks Nik!! This recipe seems to be ‘breaking the internet’ lately so had to try it for my 1 yr old twin boys ! They absolutely loved it and more went into their mouths than the floor for once!! I added 200 grams more vegetables including some celery and put the mixture straight into silicon muffin pans without cases. Once completely cooled, they came out messy when I lifted it up and out, however worked well when I turned the muffin pan upside down and popped them out onto a board. Thanks for an amazing recipe! Will definitely be a regular for my boys! Great recipe for little people! These are amazing 🙂 My 3 and 5 year olds kept eating the rice while it was cooling before I could get it into the muffin tin. At step 4 am I still supposed to use steaming temperature if using a TM5? The mixture seems quite sticky, so you could probably just make it without the egg. Finally a savoury snack my almost 2 year old will eat. I will try this next time too. Is normal patty pans (for things like kids cupcakes) ok to use? Just wondering when to add the teaspoon of apple cider vinegar? It wasn’t in the original recipe. It’s now been edited. Just wondering if you think Cauliflower Rice could substitute for the Arborio? Even perhaps uncooked Cauliflower? I’ve gone rice free and really want to try this. Maybe I will experiment! This is a winner , big time , my grandson who only ever wants plain boiled pasta plain pizza or chops on their own , said this is really good nana , for snacks yummy . Awesome! We are gluten free, preservative free, with a child staring kindy next year! 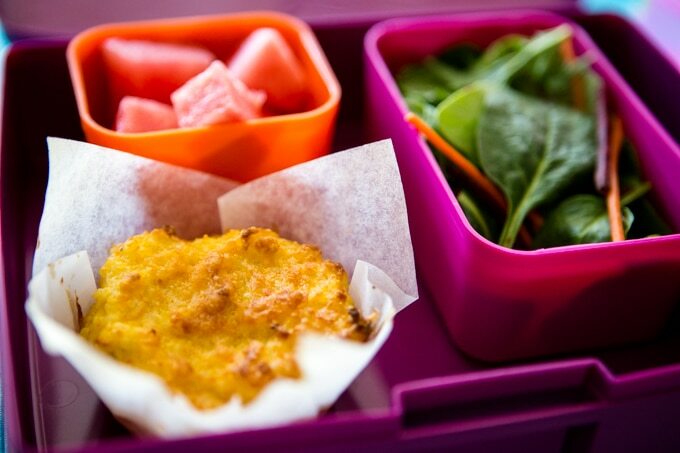 I am beginning to freak out about what on earth I will put in school lunch boxes next year. This is exactly what I needed. 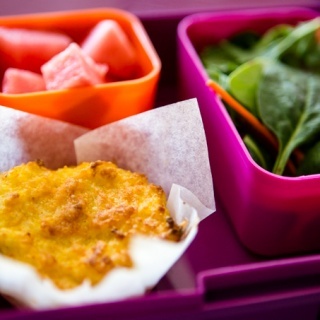 Keep these lunch box recipes coming! Great! Now I have a reason to put arborio rice on my grocery list. Thank you!! We have been really scratching our heads here for things to go into lunch boxes (2 kids + 1 hubby). I think this will work for all 3 of them… And since it’s one of your recipes I know it’ll be tasty.